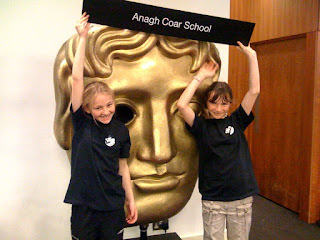 Wonderful day at BAFTA for Be Very Afraid 5. An ecelectic mix of students from 7 years through to university age and a guest list of THE key influencers in ICT and learning added up to a remarkable day - BVA is a unique networking event too - all the key influencers at the same time in the same place!. • a host of media interviews with the students - the interest in the event grows annually, not the least because it has a track record of showing very clearly what two-years-on tech will look like in learning. • and the quiet, assured, articulateness of the learners as they explained their complex technology + learning mash-ups. For the students - even with a guest list capped at 150 - it was an enjoyable, if exhausting, day. The rest of the world gets the website videos, the podcasts and the DVD. Apple, BECTA, BAFTA, Edexcel, heppell.net, Promethean, RM and Roxio. Thanks all.